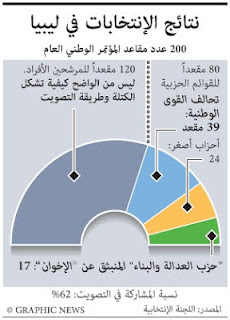 July 18, 2012 -- Libya's National Forces Alliance, a moderate Islamic coalition led by wartime prime minister Mahmoud Jibril, has won 39 seats out of the 80 reserved for parties in Libya's 200-seat national assembly. The political wing of Libya's Muslim Brotherhood won 17 seats, while smaller parties won 24. A further 120 seats are held by independent candidates whose allegiances are hard to pin down. Graphic shows official results released July 17.